You’ll probably hear that we are violent (ask Ariel Gold, idiot that she is, and ask Nina too). They’re so busy worrying about the occupation, neither bothered to do anything about another issue that is happening in a far off land. What do they care? If it isn’t a chance to bash Israel, why bother, right? If we make a difference in Thailand, as we did in Haiti, Nepal, Indonesia, Turkey, Mexico, Kenya…will it matter? No, of course not. When you hate yourself, your people, your religion…there’s little hope you’ll change. Well, Ariel and Nina – while you’ve done nothing but bash Israel, Israelis have once again been doing something amazing. This time, in Thailand. 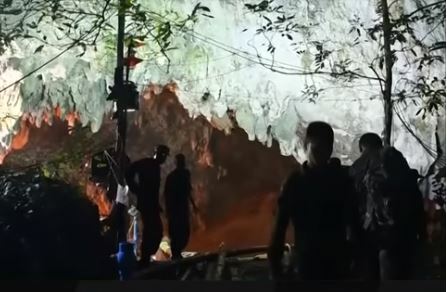 A soccer team of boys aged 11-16 entered a cave in Thailand on June 23rd, with their 25-year-old coach and have been missing for nine days. They’re bicycles were found outside a flooded cave in the Chiang Rai region in northern Thailand. Parents have gathered, Thai Navy seals have entered the cave. Hopes were dimming fast as the monsoon rains continue to flood the cave. Within two days of the boys disappearance, Israeli rescue teams were among the first to arrive to help in the rescue operation in Thailand. Amazingly, they have been joined by teams from Russia, China, Australia, Laos, Myanmar and the US. Amazingly enough, Maxtech refused the offer, “We told them we are not willing to sell, we will provide what is needed.” Maxtech has joined the rescue effort and with Israel’s help, the boys have been found. It may take weeks to extract them. But, for now, they at least getting food. More, they know people are working to find them. Such pride in Maxtech, for Israel and the other nations that rushed in to help! Let us all be much in prayer , depend upon the Lord our saviour so that the rescue team receive all the needed enabling wisdom and strength from the Lord moment by moment in this operation . The Lord who walked with Daniels friends in the fiery furnace , and shut the mouth of the lions is able to save all these precious lives . Look unto the Lord and be saved is the principle of His word .